When it’s the dead of winter and your car is sitting on the side of the road due to a busted radiator, or some other unforeseen problem, the last thing you want to do is worry about which towing company you’re going to use. You want to have the number programmed into your contacts list and I’ve got just the company for you. Kimberly, as a small suburb outside of Twin Falls, is known for its backroad truck routes. There are many semis that pass through Kimberly on a daily basis, which sometimes lends itself to accidents and roadside breakdowns. 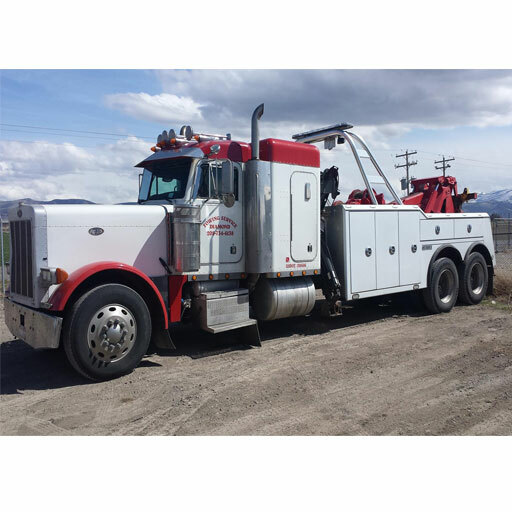 For any heavy wrecker situations, calling us at Snake River Towing will ensure that a driver will reach you quickly and the damage will be cleaned up with professionalism and skill. Each of our drivers have extensive experience towing big rig trucks, and our helpful staff will ensure that all of the paperwork and insurance is taken care of to your and your company’s liking. In case you’re wondering, they don’t just hand out AAA certifications to towing companies like candy. You have to earn that certification and no one knows that better than us at Magic Valley Towing. Servicing the Kimberly, Idaho area; we’ve built our reputation one satisfied customer at a time. Customer Service: Fast, efficient, and effective; our staff at Magic Valley Towing will have you safely off the road in no time. Whatever your situation, we’ll take great care of you and your vehicle. Quality: You’ll know as soon as you call that we at Magic Valley Towing are the real deal. You won’t worry for a minute about the well-being of your vehicle because Magic Valley Towing drivers are Wreck Master trained and certified. We will give you the highest quality service each and every time. 24 hours: No matter when you need s, we will be there. If you’re stranded on the side of the road at 2 in the morning, or if you’re involved in a crash at diner time, it truly doesn’t matter. Our great staff at Magic Valley Towing in Kimberly, ID will have you quickly and efficiently taken care of. They’ll care for your vehicle so you can focus on more important things. Performance: If you’ve ever called one of those eight-hundred numbers where they promise to connect you to whoever you need; you’ll know why performance is essential. We at Magic Valley Towing understand that we are only as good as our performance record. That’s why we work day and night to ensure every customer is our number one priority. The next time you’re stranded on the side of a road in freezing temperatures, don’t wait for a connection; give us a call and see the difference. No one wants to get stranded, especially on the freeway. No one wants to feel the stress of automotive repairs that can quickly mount the longer a problem persists. We at Magic Valley Towing have made it our mission to treat every customer like family. You’ll be rescued at lightning speed from wherever you are, no matter the situation. One call will get you the absolute best towing service in Kimberly, Idaho and before you know it, you’ll be back on the road again, tending to everything else in your life. Don’t let a breakdown derail your day. Give our great people at Magic Valley Towing a call and you’ll understand why we need to be the only towing service you ever use.